United Service Alliance, Inc. is pleased to be an authorized OEM dealer of IHI Construction Machinery Limited, producers of crawler carriers, compact excavators, track loaders and concrete buggies. 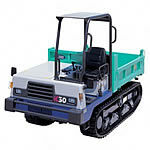 Rubber-tracked crawlers feature low ground pressure, two-speed hydrostatic drive systems, narrow track, and easy operation. These features make for an excellent carrier regardless of your particular job requirements. Units have a myriad of options, and we can custom-tailor the vehicles to meet your needs. Please contact us today to review your requirements!